Take this free practice test to see what type of questions are on the Test of Essential Academic Skills V (TEAS VI). The TEAS VI is used as an admission exam for nursing schools. It covers such subjects as science, math, English and reading comprehension. 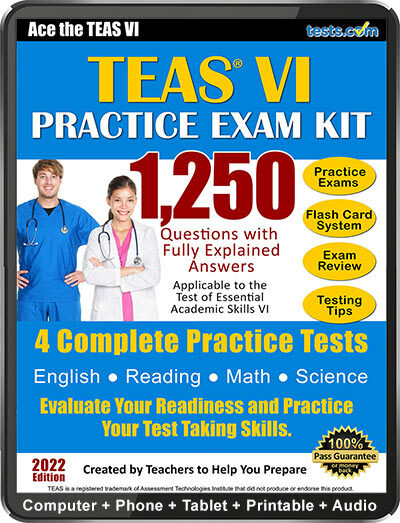 To help pass the actual TEAS VI check out the 1,250 question TEAS VI Practice Test. 1. Jack and his friends are collecting cans for the food bank. Thus far, they have collected 1500 cans. Jack has collected 60 percent of the cans. Marcia has collected 25 percent of the cans. How many cans have their other friends collected thus far? 3. The arrow is pointing to the _______________________ . 4. What role does DNA play in the S phase of the cell cycle? a. DNA condenses to become as small as possible for replication. b. DNA must uncoil and be copied. d. DNA is converted to RNA. 6. Casey walked 2.1 miles to the grocery store. She then walked 0.5 miles to the post office and 0.8 miles to work. How far did she walk in total? Convert your answer into kilometers. 7. What does the pH scale measure? a. The strength of a base. b. The strength of an acid. c. The concentration of hydroxide ions. d. The concentration of hydrogen ions. 8. Prime time is the slot when most households are watching television. Like popular series and documentaries. Identify the answer below that corrects the fragment. a. Prime time is the slot when most households are watching television like popular series and documentaries. b. Prime time is the slot when most households are watching television. Watching popular series and documentaries. c. Prime time is the slot when most households are watching television, popular series and documentaries. d. Prime time is the slot when most households are watching television; Like popular series and documentaries. 11. Which system of the human body is responsible for ensuring that nutrients are delivered to all organs and tissues? 12. An integer is a number that is a fraction. 14. A controlled experiment can only test _____. 16. Which of the following is NOT considered part of the central nervous system? 17. Which of the following is the basis of the ocean's food chain? 18. Animals cells are many times the size of bacterial cells. Approximately how much larger are they? a. Ilene Stewart has lived in the same house on Howard Street in Hobart Wisconsin for 26 years? b. Ilene Stewart has lived in the same house on howard Street in Hobart, Wisconsin for 26 years. c. Ilene stewart has lived in the same house on Howard Street in Hobart, Wisconsin, for 26 years! d. Ilene Stewart has lived in the same house, on Howard Street, in Hobart, Wisconsin, for 26 years. 20. Use the following passage to answer questions 20-23. The Vardez family went on a cruise last year. Their ship, The Golden Sun, left from Miami on a Tuesday. They stopped in Key West on Thursday before heading to the Bahamas. The ship docked in Cococay on Saturday and Nassau on Monday. Finally, the ship sailed to New York City. They arrived on Friday and flew back to Miami that day. The exhausted family was happy to be home. How many ports of call inside the U.S. did the Vardez family visit? 21. How long was the cruise overall? 22. Did the Vardez family enjoy their vacation? a. Yes, it states they were happy. b. No; they hated their trip. c. They were too tired by the end of the voyage to care. d. The passage does not contain enough information to answer the question. 23. Where did the Vardez family spend the majority of their vacation? 24. Choose the answer that corrects the error with a comma, semicolon, dash or colon. The weather I believe is hot in Florida. a. The weather - I believe - is hot in Florida. b. The weather; I believe, is hot in Florida. c. The weather I believe: is hot in Florida. d. The weather, I believe, is hot in Florida. 25. Describe the correlation between height and hair length. 26. Answer questions 26-28 using the information contained in the following passage. The horse has long held a place in the mythology of almost every culture. Horses were first depicted in caveman paintings more than 32,000 years ago, but they were not domesticated until approximately 6,000 years ago. The horse was first domesticated in Kazakhstan by the Botai people. It was not long before horses were being used as a means of transportation and as a beast of burden. They soon became far more than just another way to get around, however, as a special bond quickly sprang up between horses and their handlers that still exists to this day. Horses have a special partnership with man, and that is why they are still so popular. a. Horses make a superior form of transportation. b. Horses have long had a special relationship with humans. c. Horses are no longer popular because of modern transportation methods. d. Horses have been domesticated for a long time. 27. How long ago were horses domesticated? d. The passage does not say. 28. Who first domesticated the horse? d. The answer can not be determined from the information presented in the passage. 29. Find the area of the shaded region. The Test of Essential Academic Skills, or TEAS, is used as an entrance examination for candidates applying for admission to nursing school. The exam covers content taught in high school and measures a student's general academic knowledge and aptitude. For more on the TEAS VI, please see our TEAS V Test Guide.